Here in America's oldest city, a common answer to the standard "How's it going?" or "What's new?" is a non-ironic "Livin' the life!" I love that "Riley" is understood, that we're all-encompassing Irishmen. (Don't all the best umbrella terms emigrate from rainy climes?) Granted, Saint Augustine is a quaint seaside village with picturesque harbors and Old European architecture, and its long history makes it unique in the nation; even the circling beam of its lighthouse seems to demarcate a Venn diagram with no overlaps. But the age-old question in My Dinner With Andre begs itself: is a Himalayan mountaintop (as it were) a better spot for finding one's bliss than one's Lower East Side apartment? Saint Augustine is one spot among oh-so many on a spinning sphere, so why do migratory Rileys come down to avoid riling up? It would seem that by collective though technically unspoken agreement, New Yorkers (mostly) have decided that this is the place to escape, thereby creating an Otherworld, a B in contradistinction to A. Sure, everybody leads a life, in the sense of "hypothetical." But to live the life is to direct one's own script and also be one's own location scout. Sure, it's chic to delegate, but Rileys know better. 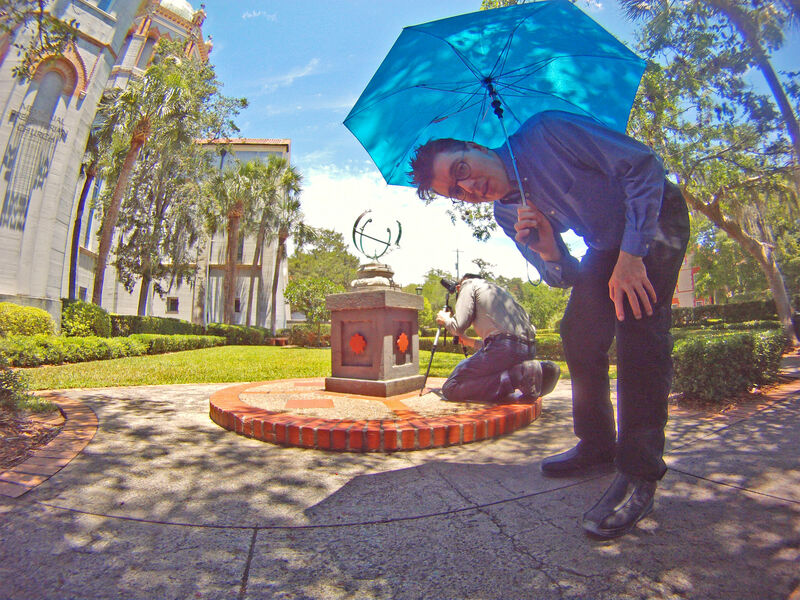 Pictured: In the foreground, Prof. Oddfellow (Riley is understood) checks the GoPro camera while Michael focuses on a sundial at the center of historic Saint Augustine.